Chances are that some of you won't be able to place the name Kent Cheng alongside a face. How about when I mention performances of his such as Lam Sai-Wing in Once Upon A Time In China or the very unlucky Fatty in Run And Kill? Anyway, I think he's a very talented actor but what I didn't know was that he had directed 7 movies (two as co-director) between 1984 and 1992. He's taken on both comedy, action and drama and it's the latter genre Why Me? belongs to. Looking at the information that can be found it is also this movie he's received most acclaim for. Looking at the dvd cover, that surprisingly mentions the other main cast besides Chow Yun-Fat, and reading up on the movie, I kept seeing similarities between this and The Lunatics. The Cat I rating did not suggest a harrowing and violent movie like Derek Yee's though. There are dark undertones in Why Me? and even though it holds basically the same commentary as The Lunatics they are of course two different films. Difference is also that Kent Cheng doesn't execute his movie flawlessly. It's a relatively simple story about a trio consisting of the child, the mother and the woman who wants to help them. It's clear where director/co-writer/actor Kent Cheng has put the majority of the effort; in the story of Fat Cat and the events & people around him. Doing triple duty doesn't prevent Kent from achieving his goals with Fat Cat's story. In his acting he steals almost every scene and it's exciting to especially see him perform and tell a story well. The script makes sure it injects the necessary depth into the main characters and I found the connections between the families to be an interesting part of the plot. Koko herself observes that she's working out the problems between two sets of families, Fat Cat's and her own. Koko is new to this line of work and while she has a genuine commitment right from the start, there lies a hint of ignorance behind the enthusiasm. She is understanding and wants nothing else but to give Fat Cat and his mother the chance to a better life. The mother is very strong regarding the point that society will only let them wait, that their fate will most likely be stuck in the bureaucratic system. When they finally do accept and enthusiastically embark on a potential new journey the initial fear of how the system works reveals itself, something Koko ignored. This kind of social commentary is not told in a bitter way by Kent but shows what reality is like, whether or not it's acceptable. His work as a director is quite solid and he makes the best parts of Why Me? look pretty attractive, especially the location shooting around the village. An actor turned director could've easily let a sloppy and amateurish feel dominate but the sections Kent concentrates on really do stand out. Especially the scenes where Koko and Fat Cat befriends one another are sweet and scenes where he messes up without really knowing it are quite tragic in a way. What flaws are there then? Well, outside of the characterdrama Kent fills the running time with lame 80s Hong Kong comedy. It's far from even amusing, second it's here the movie feels sloppily made and third it doesn't meld with the drama that Why Me? is. There's a select few instances where the comedy becomes more human and one scene where this is evident is Fat Cat's interview scene. Kent Cheng really provides some warm and, coming from the character, honest humour but besides that this viewer was wanted the main story to take over the picture again. By now you must've gotten a hint of what an amazing performance Kent Cheng provides but by his side are two very strong female performers. 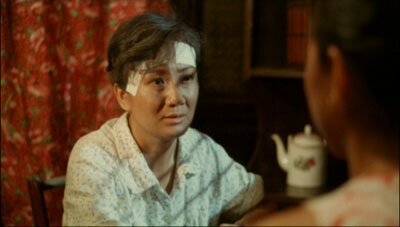 Veteran actress Chiao Chiao plays the mother, a woman with very strong beliefs and who would still do anything for her son. Olivia Cheng nicely captures the essence of Koko, a sweet and caring young woman with troubles of her own. I was actually surprised and in the end impressed by the range she shows at whatever age she was in 1985. 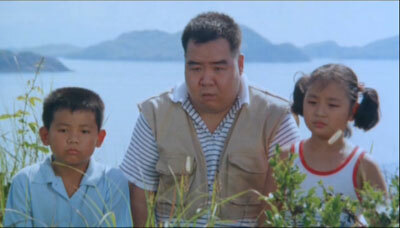 Paul Chu (The Killer) has an important supporting role as the loser father of KoKo and Chow Yun-Fat plays the boss at the social workers office. His character never really becomes very interesting but he's in one of the most important scenes that convey the core message of the film. This is probably Kent Cheng's career best performance. Why Me? does reach us with it's message but weaker parts of the narrative makes the whole impact less than it should've been. Universe has given us a respectable 1.85:1 print of an older movie. On the plus side there's not much damage on the print but a softness lies over it. It's still very watchable considering the age of the movie. No remix here thankfully and the original Cantonese 2.0 mono track sounds as good as you would expect of a smaller film. There's a little distortion both in music and dialogue but it worked fine overall. A mandarin 2.0 dub is also included. The English subtitles also did it's job. You expect to find error in grammar etc. for older movies and there were a select few. Nothing to confuse or detract from the overall viewing experience though. Japanese, Korean, French, Bahasa Indonesian, traditional Chinese and simplified Chinese subtitles are also included. Not much in the way of extras usual. There are Star's Files for Olivia Cheng, Kent Cheng and Chow Yun-Fat that are reasonably informative. Trailers for Why Me?, The Occupant, The Fun, The Luck & The Tycoon and Diary Of A Big Man (all being Chow Yun-Fat movies) are also on the disc.